It's time for the weekly edition of In Case You Missed It from the Space subsite paired with links from around the web of news we didn't cover here. It was a slow-traffic week for Space this week, so if you read something you like, pass it along to a friend! Quantum mechanics inspiring jewellery designs. Celebrating May the 4th with Star Wars science stories. A wee bit of love for the Cat's Eye nebula. Celebrating the anniversary of Alan Shepard's first spaceflight. Celebrating Cinco de Mayo with cool cloud patterns over Guadalupe. Video of a daytime fireball in Toronto, Canada. Star Wars on the red carpet as a Death Star evening gown. Real life Doctor Who/Star Trek/Ghostbusters crossover resulting in an acoustic tractor beam. The US climate change report is bad news. I got a bit obsessed with space junk, first finding it pretty, then researching the history of space junk, and finally finding junk crashed in Australia. I ran into a bit of trouble while playing the Kerbal Space Program. Tornado destruction traced out in a satellite image. The sun was downright interesting this week, with image releases of an unprecedented set of solar flare detailed observations, a weirdly soothing solar flare video, a geometrically striking coronal hole, and a new set of models of how our magnetic field blows in the solar wind. Tracking people chatting about sunrises on Twitter is surprisingly fun. A look at Titan from different heights in the atmosphere. An exploration of new technology for automatic hazard detection. The science of sinkholes, including the recent surge of car-eating sinkholes. Dinosaur-day extended beyond one day, looking at my first dinosaur, illustrating the Iguanodon, a national park dedicated to dinosaurs. Fossilized footprints are a fun mystery. The science in EuroVision songs. 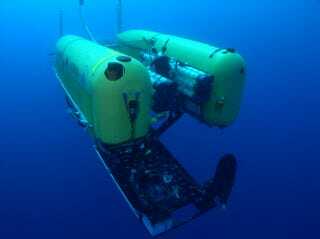 A deep-sea robotic explorer was lost despite a whole lot of safeguards, probably imploding in the depths. Photographs from a continental plate tearing apart. Why is seismic interpretation so difficult? This flowchart starts getting at the complexity of the problem. Fundamental principles of science in 140 characters. Top image: Nereus, the lost deep-sea explorer. Photography credit: Woods Hole Oceanographic Institution.